In the same manner as the Golden State Warriors vs the Los Angeles Clippers or the San Leandro Pirates vs the James Logan Colts, the rivalry between Ford and Chevrolet is one that has permeated the culture of San Leandro, California. The competition continues. The 2019 Ford Escape and 2019 Chevy Equinox SUV crossovers are widely sought out by parents, young adults and daily commuters — understandably so. Both vehicles offer strong engine options, low starting MSRPs, a variety of tech and loads of cargo space. But which one is best for you? 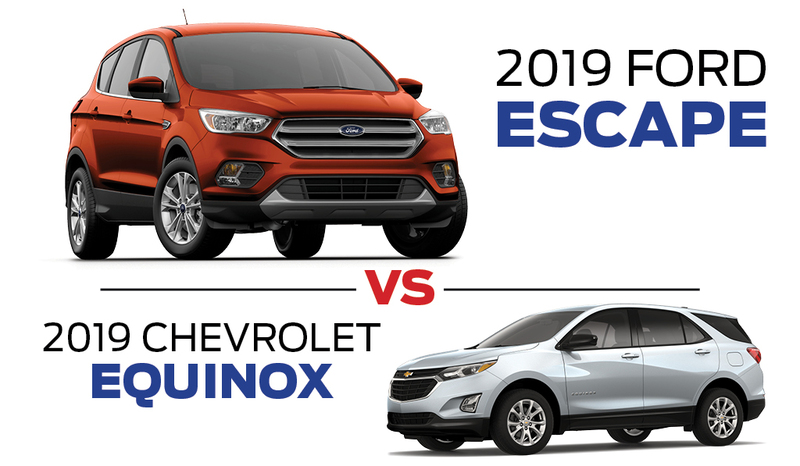 We’re rooting for the 2019 Ford Escape; see why!In the same manner as the Golden State Warriors vs the Los Angeles Clippers or the San Leandro Pirates vs the James Logan Colts, the rivalry between Ford and Chevrolet is one that has permeated the culture of San Leandro, California. The competition continues. The 2019 Ford Escape and 2019 Chevy Equinox SUV crossovers are widely sought out by parents, young adults and daily commuters — understandably so. Both vehicles offer strong engine options, low starting MSRPs, a variety of tech and loads of cargo space. But which one is best for you? We’re rooting for the 2019 Ford Escape; see why! Choose between 3 powerful engine options for the 2019 Ford Escape. The 2.5-liter i-VCT is a flex-fuel-capable engine that has a 6-speed SelectShift® automatic transmission and gets an EPA estimated 24 mpgs combined. You also get Active Grille Shutters and an Easy Fuel® capless fuel filler, which are standard on every 2019 Escape. A turbocharged 1.5-liter Ecoboost and 2.0-liter Ecoboost are also available. With the 2.0-liter engine, riders can tow up to 3,500 lbs. around San Leandro. Get yours now at The Ford Store San Leandro. The 2019 Chevy Equinox comes standard with a 1.5-liter turbocharged 4-cylinder engine. A 2.0-liter turbocharged or 1.6-liter turbodiesel is also available. Mountain bikes, ATVs, hiking gear and more — whatever you need to bring along, the 2019 Ford Escape has the space to carry it. You have access to 68 cu.ft of cargo space. The 60/40 split row can easily fold flat to maximize storage space. The available hands-free foot-activated liftgate works as an extra set of hands, allowing you to open and close the trunk with ease. All you need to do is kick your foot under the bumper. The 2019 Chevrolet Equinox has only 63.9 cu.ft of cargo space. This safety package boasts several available driver-assist features, designed to make driving around and staying safe enjoyable and effortless. Adaptive Crusie Control & Forward Collision Warning with Brake Support, Auto High-beam Headlamps, BLIS (blind spot information system) with Cross-Traffic Alert, and Lane-Keeping System are some of the safety features included. The Escapes’ vibrant 8-inch touchscreen is the command center of SYNC 3 voice-activated technology. Use this system with your paired mobile device to be instantly connected. Once linked in, you’re able to make calls and send/receive text messages. It’s activated through voice commands, helping you conveniently and safely stay connected. Even when you’re unplugged, you can stay connected thanks to Ford’s Wi-Fi Hotspot. You’ll get fast data speeds through a 4G LTE connection on the AT&T nationwide wireless network. Up to 10 devices can be connected and make/receive calls while the Hotspot is in use. Apple CarPlay and Android Auto are both apps that mirror your phone’s interface on the vehicle’s touchscreen or dashboard. It helps you stay focused, connected and entertained by making it easier and safer to use apps from your phone while on the road. We’ve concluded that the 2019 Ford Escape is the winner. It beats the 2019 Chevy Equinox in cargo space and engine options — it also has amazing connectivity features for you and your family. Visit The Ford Store San Leandro to get up close and personal with this champ by scheduling a test drive. We look forward to seeing you!